Our built environment affects us our living standards, creativity, and mood. We want to re-define our environment with our creative instruments. We will examine the doors of the selected studios and how it connects us with our surroundings. We will discuss on ‘door’ through different perspectives; re-think as a border / limit / boundary / transitive / connective / crossing element. 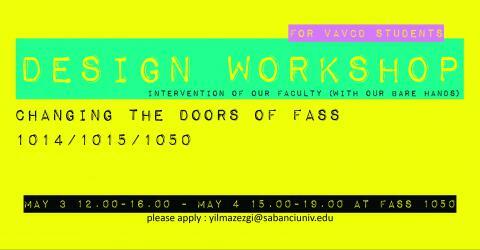 And as an outcome students are expected to design the doors of FASS 1014/1015/1050. All VAVCD students are welcomed to be a part of the change. *aims to change/design studio doors (FASS 1014/1014/1050) collectively. *will be on Thursday, May 3 (12.00-16.00 pm) and Friday, May 4 (15.00-19.00) at FASS 1050. Application of the design will be after the final exams (The exact date will be announced). *needs that all participants should bring their own computers, drawing tools etc. *will be held by Ezgi Yılmaz (Research Assistant/Architect) and Nilüfer Karanfil (Designer/Architect).